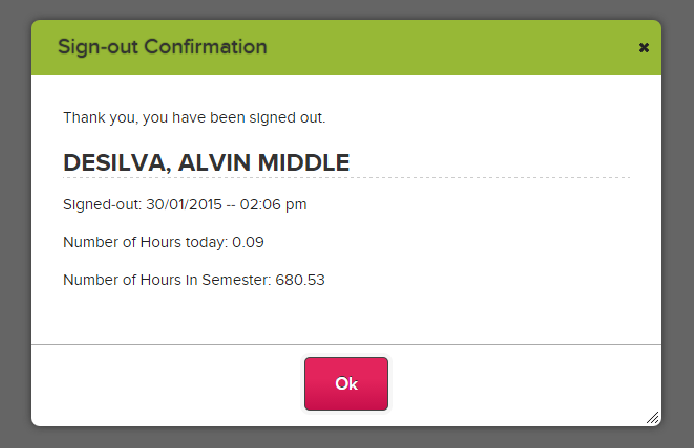 The “Student Sign-In / Sign-Out” app supports direct sign in/out by students, via a PIN. Once configured, the screens work virtually the same as the Parent sign-in version. An admin will need to launch the Kiosk mode so on a dedicated machine and students will need to be given their PIN number to sign themselves in and out. Students simply needs to enter their PIN to the Kiosk and click "Enter"
Once the PIN number is submitted, the student can verify the current sign-in entry and confirm. As an administrator, you can use the “Student PINS” menu to Generate and View PINS for students.